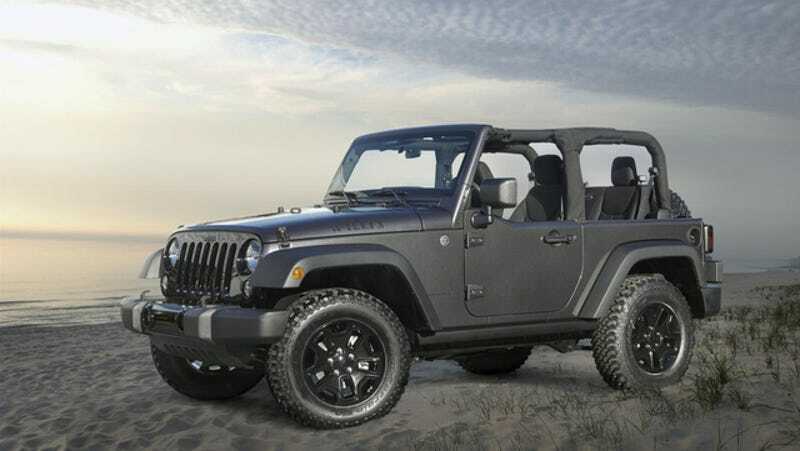 After debuting at the 2013 Los Angeles International Auto Show, the latest special edition Wrangler will hit the showrooms early next year at $25,795. The Willys Wheeler is the purist's dream as Chrysler imagines it. Based on the Wrangler Sport, this new Jeep focuses on upgraded hardware that serves a functional purpose, including a Dana 44 rear axle with limited-slip rear differential and 3.73 gears, BF Goodrich KM Mud Terrain LT255/75R17 tires, rock rails and a new Jeep Trail Rated Kit that includes a D-Ring, tow strap and gloves in a branded bag. This works with the 4x4 part-time, two-speed transfer case with a 2.72:1 low-range gear ratio to improve its off-road capabilities. ...then put a gloss black grille with black Jeep badge, gloss black front and rear bumper appliques, historic satin black "4 Wheel Drive" rear tailgate decal and "Willys" hood decals, high-gloss black 17-inch aluminum wheels and a Sunrider soft top and deep-tint sunscreen rear windows on the base Wrangler Sport to make it look old school. Powered by the 3.6-liter Pentastar V6 with 285 horsepower and 260 ft-lb or torque linked to a six-speed manual or an available five-speed automatic, the Willys Wheeler will be available in any Wrangler color and come with satellite radio as standard, with the Sunrider soft top and black-splatter Freedom Top remaining on the options list, just like the Wrangler's iconic half doors. The two-door will start at $25,795, with the Unlimited costing almost four grand more at $29,595.